After my sighting of the weevils a few weeks back I was only too pleased to be rid of them, until I realised...that when there is one... there are many or should I say thousands of the little critters, everywhere... I mean EVERYWHERE. Everything that was open, in a plastic container (yes they penetrated my containers) or in a paper bag was crawling with them which meant it all went in the bin, no discussion. Everything else that was sealed properly got a wipe down with hot soapy water and vinegar and sat on the kitchen counters for two days while I aired my newly washed and vinegar-ed cupboards out. After putting what was left after my cull back inside the cupboards I was only too happy to never go back in there again in fear of seeing another critter but then Sally Wise's new cookbook 'A Kitchen in the Valley' turned up on my doorstep and I took the dive and bought flour. I am still not game enough to put it in my cupboard and have stored it in my freezer just as google instructed me to. Supposedly it's to kill any un-hatched eggs and I'm keen to give anything a go. But enough on my cupboard dramas and more on this cookbook you say? I agree. This new book of Sally Wise's is full of recipes using local produce found in the Derwent Valley, Tasmania where Sally lives. The recipes make you want to fill a long table full of food and invite everyone you know over just to feed them. Sally's home sounds picturesque with raspberry patches in the summer and a bed of giant rhubarb under the window and how can I forget Truffles the kitten?! The photography sets the feel for the book and although not every recipe has a photo, the titles of the recipes are tempting enough. There are some great sounding bread recipes in this book such as Tasty Breakfast Twirl which is a sort-of decadent stuffed breakfast bread, Raisin Bread and Turkish Breads with Spinach and Feta Stuffing or a Tomato and Bacon filling. Can you tell I have missed baking?? There are also some classic afternoon-tea treats that would make a great home-made high tea like Neenish Tarts which I remember from the local bakery as a kid and the Raspberry and Cream Cheesecake Slice...yum. But what caught my eye for dinner was the recipe for Tikka Chicken with Mint Chutney and Naan. There was no fancy curry pastes to make in advance and no ingredients which you need a whole day to find and a trip to every supermarket in your area, everything was in my pantry (expect the flour which is still in my freezer). I started my making the naan bread so it had time to rise before starting the curry which surprised me as I have this idea that a curry is a long slow cooking process and this relatively quick. I made one slight change in the naan bread and used full cream milk instead of coconut milk as I have a thing about opening a can and not using the whole thing and I was already using a whole can of coconut milk in the curry so happily used regular milk instead and it worked just fine. However I will say this, these naan breads are not your traditional restaurant naans which have the gnarly black bits with bubbles of dense dough, these are light and almost fluffy. I'm not sure if this was just me or if they were meant to do this (there is no photo for this recipe) but mine turned into a kind of pocket when I baked them which was great to fill with the curry and chutney and although sometimes you want those naan breads with the black gnarly bits, these were just as delicious and much lighter which meant you could eat more of them. Always a positive. And for the chicken tikka and chutney. Wow. Tristan said, quote and quote 'this is one of the best curries I've ever eaten'. He didn't say it was the best but I'll take that compliment anyway and I had to agree with him. It is a much lighter curry then anything I've had from the local Indian restaurant and although I say it was light, it was packed full of flavour and didn't have that layer of oil which you sometimes get from using the store-bought curry pastes. I was a little worried about the sauce being quite liquid but the recipe says you can thicken it by making a cornflour slurry but I let it simmer away for a little longer instead as I have a slight aversion with cornflour and curries together...just reduce it I say. With lighter naan breads, the fresh mint chutney, I served it with some steamed rice and roasted cauliflower (how good is cauliflower in curry?!) and just so you know, it got even better the next day. Overall it was a pretty damn delicious dinner which we gorged ourselves on a huge bowl each while watching the new StarWars movie on the couch. A perfect date night in if you ask me. Adapted from 'A Kitchen in the Valley' by Sally Wise. - Starting with the naan breads, place flour, yeast, sugar, baking powder and one teaspoon salt in a medium bowl and mix well. Whisk together the coconut milk (or regular milk), yoghurt, egg, olive oil and lemon juice. Pour into the dry mixture and mix using a wooden spoon until well combined. This is a wet mixture so don't be alarmed that this looks more like a mess than a dough. Cover with a tea towel and leave in a warm place to rise until doubled in size, about 1 hour and 15 minutes. 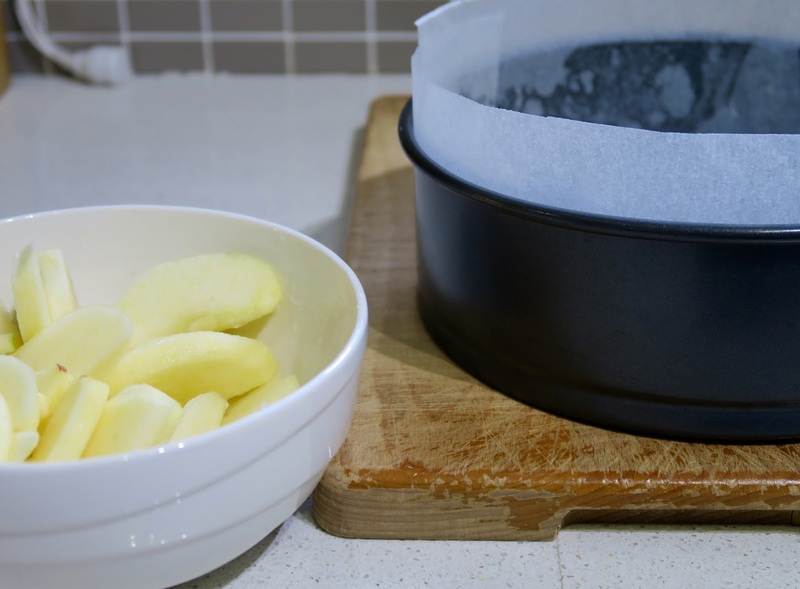 - Line two baking trays with baking paper and preheat your oven to 200C. -Turn the risen dough onto a lightly floured bench and knead for 2-3 minutes or until smooth. Cut into 4-6 pieces and dust each lightly with flour. Roll each piece into an oval about 12-15cm long and 8-10cm wide. Place on lined trays, covered with a tea towel to rise for 15 minutes. - Bake the naan for 15 minutes or until cooked through and golden on top. - Meanwhile start on your chicken. To make the tikka chicken, heat the coconut oil in a saucepan over medium-high heat and sauté the chicken until it changes colour. Add the onion, garlic and ginger and cook for about 2 minutes or until fragrant. Add the spices along with 1 teaspoon of salt and stir to coat everything in the pan. Lastly, stir in the coconut milk and chicken stock and bring to a boil. - Reduce to a simmer and cook for about 10-15 minutes until the chicken is tender. If your sauce needs thickening, simmer for 10 minutes longer or thicken with a cornflour slurry (3 teaspoon cornflour mixed with 2 tablespoons water). - Place all the ingredients except the yoghurt into a small food processor and process until smooth. Stir the yoghurt into the paste. Taste and season with pepper and a little salt if necessary. Serve the curry with the naan, steamed rice and mint chutney. 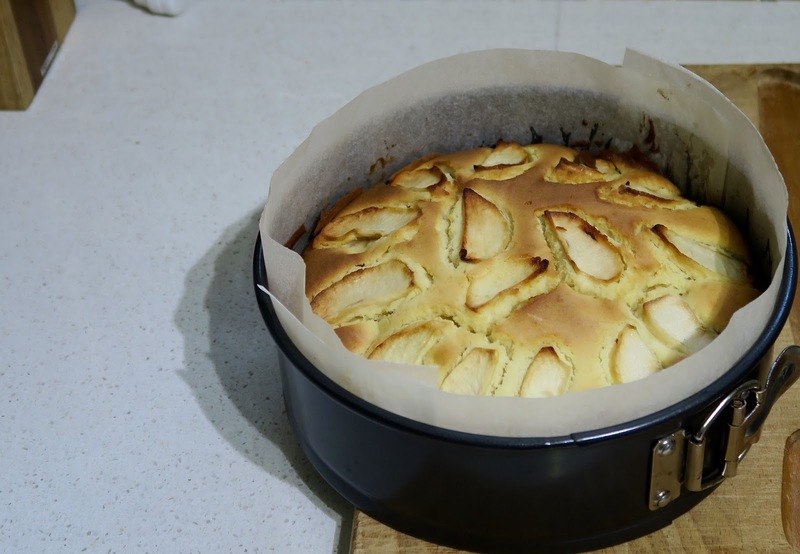 Torta di Mele (apple cake) from 'Florentine' by Emiko Davies. Over the weekend I escaped my apartment and went to my mums to mess her kitchen up instead, plus she has a dishwasher which makes the clean up sooo much more pleasant. I gave dad the option of Bomboloncini (donut holes) or Torta di Mele (apple cake), both recipes from Emiko Davies new cookbook Florentine. Although I gave him the choice I knew before I even asked that he'd choose the apple cake, I was secretly hoping he would pick the donut holes but since I'm a good daughter I made the apple cake for him and will have to save donut holes for another day. Florentine, wow. It is such a beautiful book. The cover is stunning and the photos inside transport you to the streets of Florence, Italy. Emiko has some snaps of the inside of the book on her site, so beautiful. It made me want to max out my credit card and buy a plane ticket but instead I am just going to have to bring Florence to my little corner of the world with her beautiful recipes. There are a few I cannot wait to try, of course the Bomboloncini (donut holes) I keep going on about but also the Polpettone alla Fiorentina (Florentine meatloaf) and the Pane Toscano (tuscan bread). I have a soft spot for meatloaf so can't wait to try it and tuscan bread... who doesn't love freshly baked bread?? The smell of it straight out of the oven is mouth watering but then again so was this apple cake. About 20 minutes after I put it in the oven we could start to smell the buttery goodness and sweet apples and it instantly made us hungry and eager for it to be finished. Still warm we had a piece with a cuppa and it was the perfect combination. 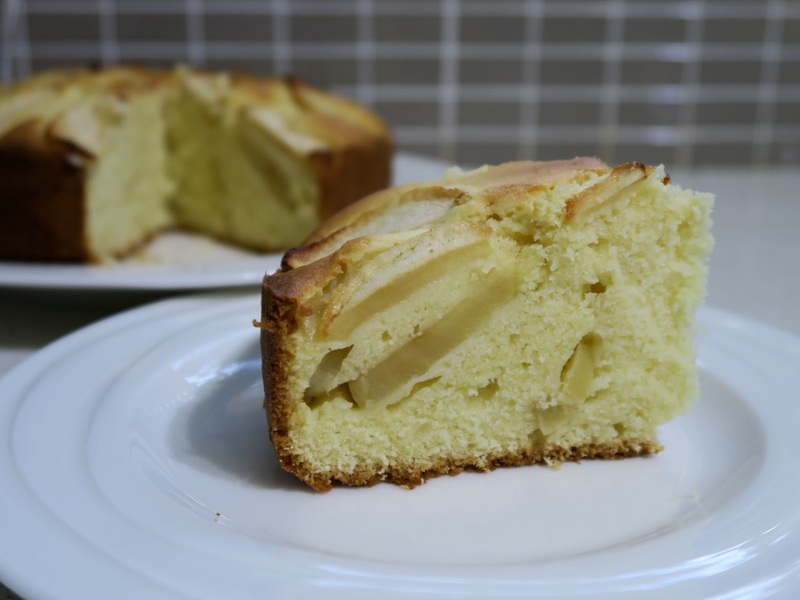 The sweet apple on top and inside the cake was so delicious. I think the cake recipe would also work folding through mixed berries, its a lovely and buttery cake that isn't too sweet so works perfectly with the added fruit. It reminded me of a cake my Aunty made but poured sweetened mixed berries, heated up like a runny jam over the top when I went to visit years ago. Between four of us we managed to polish off the whole cake while drinking tea and playing rummicub late into the night. A little tip to keep in mind, the recipe says '2 large apples' and I used 2 small to medium sized apples thinking it'd be ok but I recommend using large apples, mine could have done with more apple on the inside in some slices. And don't be too alarmed when the mix starts curdling, it did this to me when I added the eggs to the butter but I turned the speed up and it seemed to come together until I added the milk which then made it curdle even more. My eggs and milk were cold though so I don't think it would have curdled if I had warmed the milk slightly to take the chill off, same for the eggs. But as soon as I folded the flour through it all came together perfectly, no dramas. My mum has a dream oven and it baked so much better than if I'd baked it at home, it was evenly golden on top and didn't have a half burnt side. Such a great afternoon/morning tea recipe with a cuppa or two. recipe from Florentine by Emiko Davies. - Preheat oven to 180C/360F and line a 23cm/9inch cake tin. 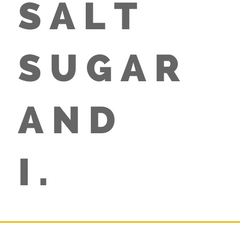 - Place the apple slices in a bowl with the lemon juice and 2 tablespoons of the sugar. - Beat remaining sugar with the butter until pale and creamy, add the eggs and beat very well until you have a thick, pale mixture. Add the milk and lemon zest, then fold through the flour, baking powder and salt then half the apples slices along with all the lemon juice to combine. 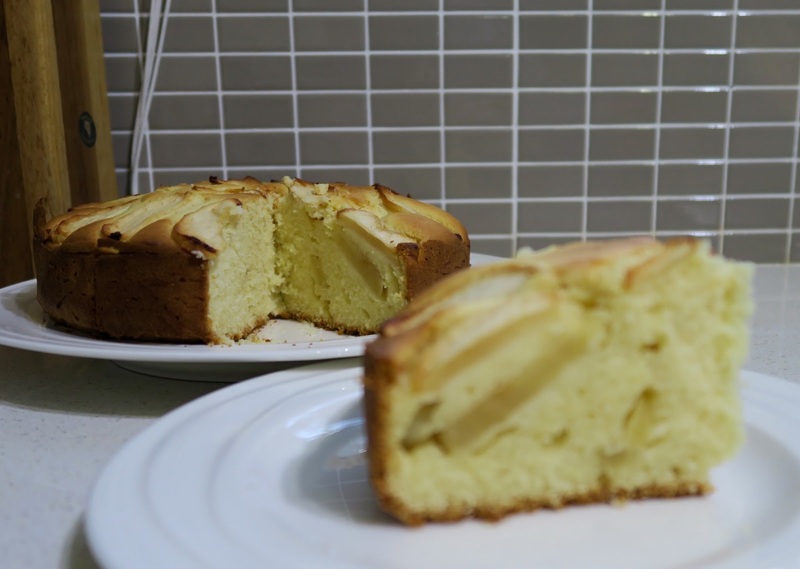 - Pour into prepared tin and place the remaining apple slices all over the top of the surface, Bake for 1 hour, or until the top is golden and springy to the touch. Note: As this cake isn't overly sweet, Emiko suggests brushing the top with some apricot jam for a little shine and that extra bit of sweetness as an option for those of us who love things on the sweeter side.